The situation is the penury and stress imposed on a middle class family as a result of its unwavering support of the father's agitation for a fairer and more equitable world than capitalism provides. That's the joke! It just so happens that the father is channelling Karl Marx - in the present day. 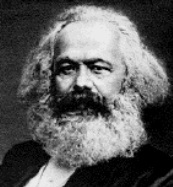 His family unit and his best friend are dead ringers for Marx's. And they're riding the crest of the post-capitalist wave. Currently resides as a 2-page proposal, the bible and a pilot episode.